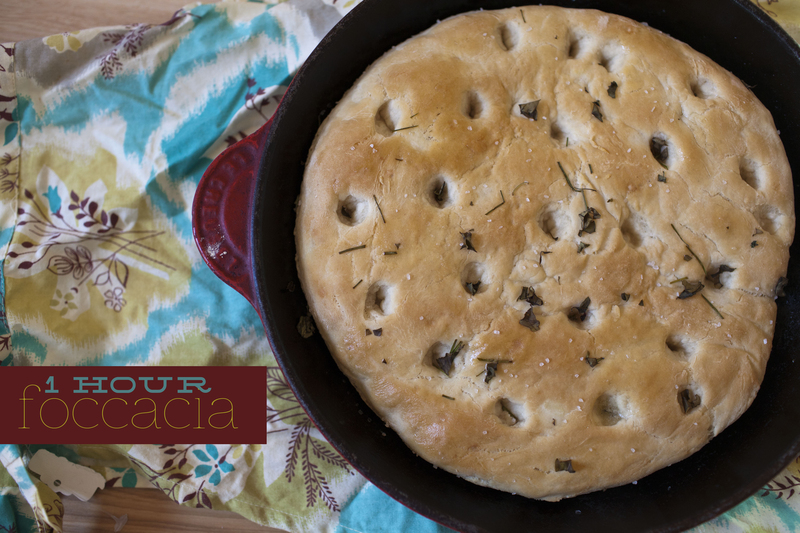 Here is a very easy, one hour or less focaccia bread recipe I found on pinterest. I imagine this would be so easy to experiment with – adding all kinds of flavor combinations on top. I threw some fresh herbs and salt on top of mine. This didn’t last very long in our house! Place water and sugar in a large mixing bowl of a stand mixer. Stir until sugar dissolves. Sprinkle yeast over the water and stir few times. Let sit until foamy ( about 5 minutes). Turn the mixer on low speed and add 1 cup of flour and salt. Mix until combined. Gradually add as much of the remaining cup of flour as you can ( it can be only 3/4 of it) and mix until the dough pulls away from the sides of the bowl. In the meantime, preheat the oven to 220 degrees F and when it’s ready turn it off. Keep the door closed. Place dough onto a floured surface (use the remaining flour from the second cup) and fold the dough few times until you feel it’s smooth and not sticky anymore. Shape into a ball. Roll out the dough into a size of your skillet. Place in skillet. Stretch up the sides. Cover with a kitchen towel and place in the oven for 20 minutes. Take the skillet out of the oven and preheat the oven to 400 degrees F. Make indentations in the dough with your fingers. Place skillet with dough in the preheated oven and bake 20 minutes, or until golden brown. Brush with remaining butter. Let cool until safe to the touch and slice. Serve. 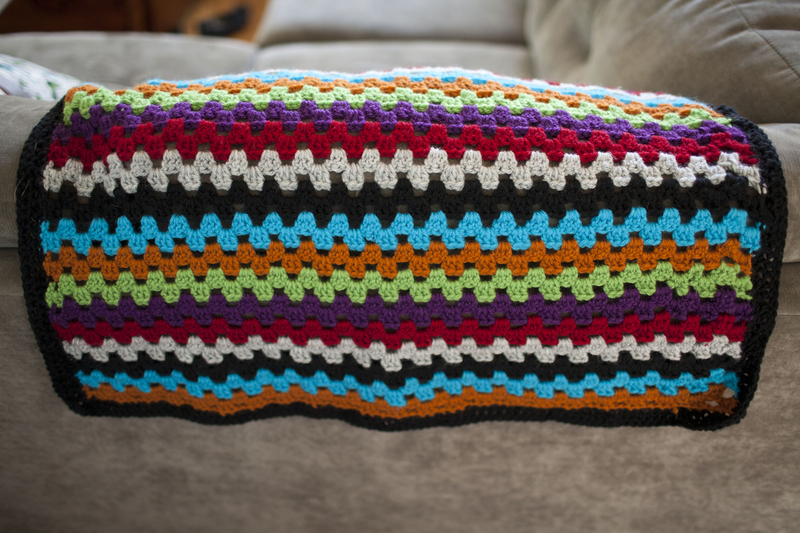 I made another granny stripe blanket. This time in baby size. One of dj’s friends is having a baby girl in august, so I hope they like this! I used the same pattern I used last time, just reducing the number of stitches I started with (maybe by half?). I used Vanna’s choice yarn, and only needed one skein of each color, using size a size 5.5 hook. 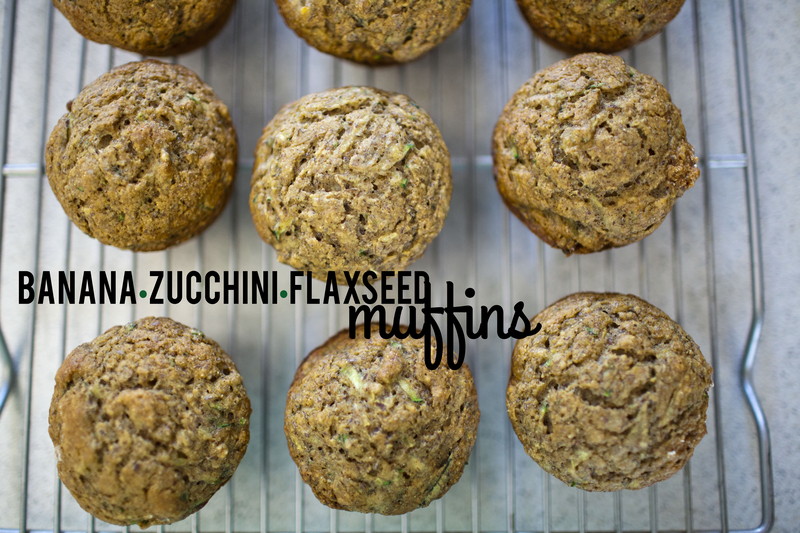 banana, zucchini & flaxseed muffins. It’s about that time of year where we have more zucchini’s than we know what to do with! I had a rouge banana laying around as well, so I figured it was time to make shutterbean’s banana zucchini and flaxseed muffins! These were pretty easy to veganize, are packed with healthy zucchini and don’t use any oil?! They turned out great! Milo is going to love them! My neighbor dropped off a whole bunch of rhubarb she grew in her garden at my back door a few weeks ago – so that left me searching for things to do with it. I’ve never actually used rhubarb before! It seems the most common use for rhubarb is pie….but I wasn’t really in the market for a pie, so I made these strawberry rhubarb muffins, from bittersweet’s blog. Bittersweet’s recipes rarely let me down. I try to find muffins lower in fat and sugar – and these sort of fit that bill. They turned out very muffin like – nice and tall, with a crumbly topping. They didn’t turn out too dense – be careful not to overmix….They were a great breakfast treat. I made a double batch another day – trying to use the rest of this rhubarb up, and they freeze well too! Dj said they were the best muffins I have made yet! They were a hit with the little guy too, who was super upset this morning when he found out his dad ate the last one. Preheat oven to 400°. Grease muffin tins or line with cupcake liners, then set aside. In a medium bowl, combine the non-dairy milk, vinegar, sugars, oil and vanilla, stirring until homogenous. In another bowl, mix together the flours, baking powder, baking soda, cardamom and salt. Mix in the rhubarb and strawberries into this dry mixture, tossing to coat the produce with a light dusting of flour mixture. This helps the fruit stay at the center of the muffin, instead of sinking to the bottom (it really works!). Pour the wet ingredients into the dry and stir until just combined. 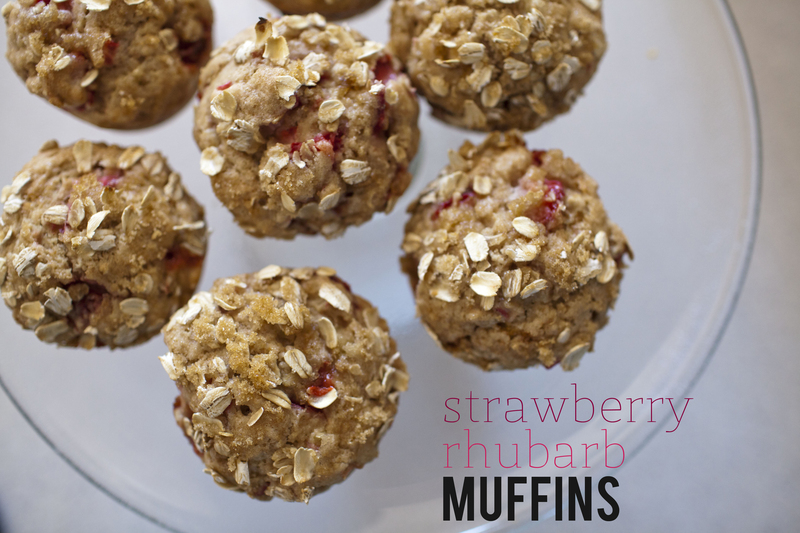 Distribute the batter evenly into the muffin tins and top them with a sprinkle of sugar and oats. Bake for 20-25 minutes (depending on the size of muffin pan you use), until a toothpick comes out clean. Let cool in the pan for about 10 minutes, then turn the muffins out onto a wire rack. 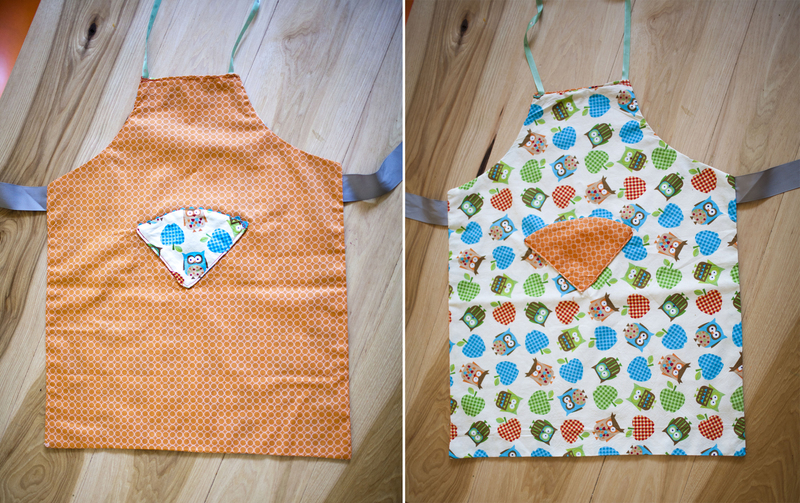 I made this reversible apron for my friend’s daughter’s birthday. You make it with a fat quarter, and you use every piece of the fabric because you turn the armholes into pockets! It was my first time using rick-rack, but I love the little flair it adds to the apron. 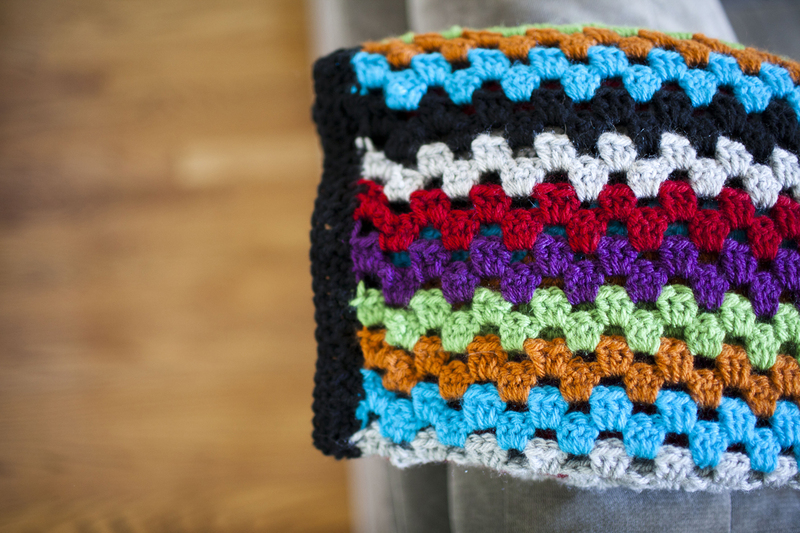 This is a pretty easy project, and it takes no time to sew! The instructions are really well explained, and can be found here. Seems like the possibilities are endless…..I definitely see more of these in my future, especially because I saw some awesome superhero fabric at Jo-anns the other day that was just calling Milo’s name! seitan tacos with coconut and lime. 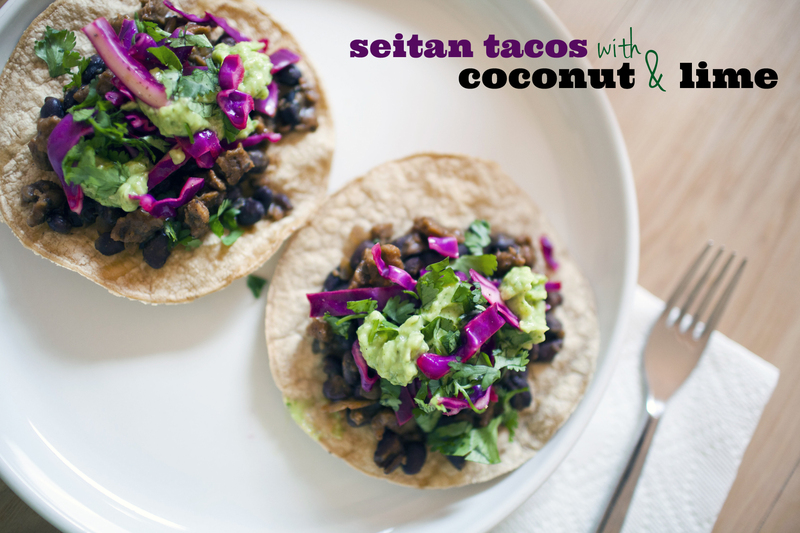 I had originally saw this recipe for pork tacos and I thought I could try to make them, using ground uptons seitan….Lo and behold – I think I just found my new favorite taco recipe. We may or may not have made these twice in one week….. I prefer to eat mine tostada style, but they make great soft tacos as well. I top them with a cabbage slaw (recipe below), avocado and cilantro. Yum! In a large skillet, heat one tablespoon of olive oil over medium heat. Add onion, garlic, and a large pinch of salt and pepper; cook, stirring occasionally, until they’ve softened, about 3 to 5 minutes. Push the onion and garlic to one side of the pan, and add the cumin, paprika, oregano, and cayenne. Let sizzle in the pan until they’re toasted and fragrant, about 1 minute, then stir well until the onions and garlic are evenly coated with the spices. Add the seitan to the pan. Cook and stir occasionally, until the seitan is just cooked through. Add the coconut milk; simmer for about 5 minutes until thickened, then stir in the black beans, pineapple juice and 1 tablespoon lime juice and cook for an additional minute or two. Taste and add more lime juice if needed. Adjust the seasoning to taste. Add to tortillas and top with toppings of your choice! Mix together. Let sit, chilling in fridge for 15-20 minutes or until you’re ready to serve. Summer has gotten the best of us, I guess! Anyway, something about the long holiday weekends makes me want to take on a sewing project. And thats just what I did. 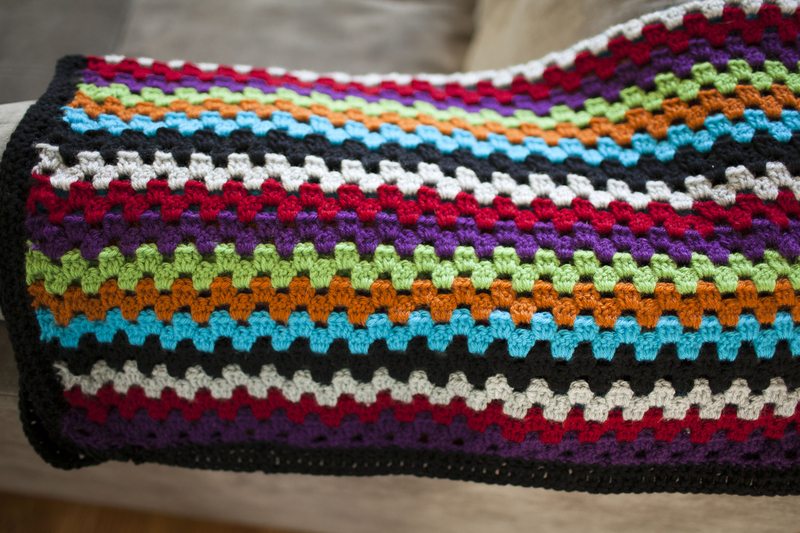 My friend Emily and I have been drooling over this pattern since she launched it. We purchased it last September, and have been purchasing fabric since then with the dreams that someday we will execute this dress. We were both kind of timid going into this, but knew with eachother’s help we could figure it out. We got a later than we wanted start on friday afternoon, and got to it. I used a sheet from the thrift store, so if it worked out, it would be cute, but if it didn’t, I only lost $1.99. Glad I used the sheet because it was definitely a learning experience. The sheet was probably too sheer to use as a dress and because it was a sheet, it was kind of more potato-sacky than I would have liked. I also got to really test the fit and see how it works. According to my measurements, I was probably in between a xs and small, so I went with a small the first time around. I retraced my pattern pieces and resized my muslin in a xsmall, and I went for it, hoping for less bulk in the back, and it seemed to work. You can see other completed dresses here. 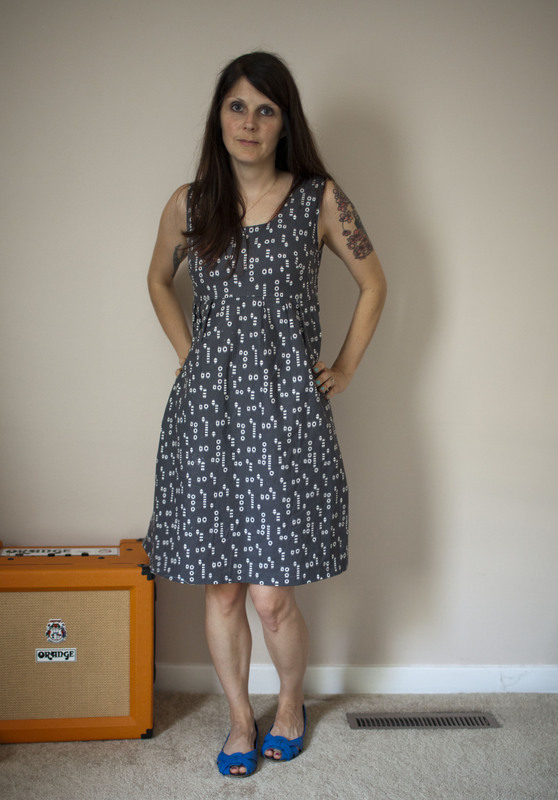 If you are a beginner sewer, like me, and looking to kick your sewing projects up a notch, go for the washi dress. You can totally do it!